Chowder was born in April on the 23rd. Such a beautiful black and silver pup with an all-day disapproving look that just melts my heart. He is as hyper as any other puppy but as this photo shows, puppies do have accidents. The greatest thing is.. he seems to be the most carefree pup in the world. Chowder has an accident, so close to his blankie, yet still is calm and in a sense: un-phased. 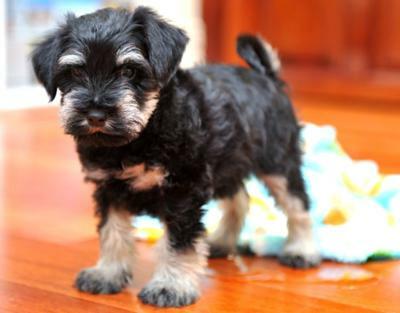 HE IS SO ADORABLE SCHNAUZERS ARE VERY SMART AND SPOILED DOGS. What an adorable little puppy. It makes me want to go out and adopt #8. Like NOT!!!! !